I’ve had a few requests for this recipe, one in particular from an exiled Southerner now gracing New Hampshire. Mrs. E.’s colleague was happy to answer the call. Glad to oblige…I am sure that there are lots of recipes out there like this because it is so easy (always important in my book). Beat yolks (with fork or eggbeater), add lemon juice and rind. Add milk slowly, beating as you pour. Pour into pie crust. For meringue: Beat egg whites and cream of tartar with an electric mixer until soft peaks form. Gradually add sugar beating at high speed until stiff peaks form and sugar dissolves. Bake at 325-350 degrees for 10-12 minutes to brown meringue. 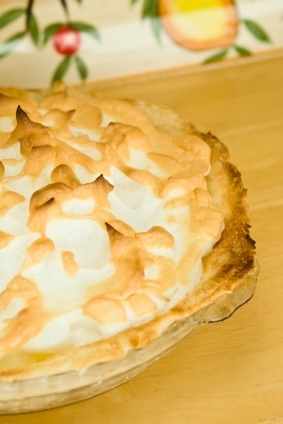 This entry was posted in Entertaining and tagged lAunt Edna's emon meringue pie. Bookmark the permalink. I love lemon, so any recipe which is made with lemon is my favorite, of course i like this pie, actually i don’t have time to do it as i would like but i often buy it from a bake store. I think i will take some time this weekend to do this delicious recipe. Wonderful! It looks beautiful–thanks! Can’t wait to try it this weekend! I think I am using too many exclamation points!! I must ask my mother for her recipe and compare. I loved when she made lemon, rhubarb, strawberry, chess, derby, chocolate, coconut cream, apricot, peach ….pies! A family with 7 children needs to eat pie, well any family truly is happier with pie!